Two British children, A teenage girl and young boy, are almost murdered by their father, who ultimately kills himself, leaving his two children stranded in the Australian outback, they attempt to survive on their own until they encounter a young Aboriginal boy, who is on a ritualistic ''Walkabout''. I don't think the Australian outback has really ever been as portrayed as beautifully, mysterious or awe inspiring as it is in this film, it really takes on a life of its own and its mesmerizing to watch, Director and Cinematographer Roeg really captures the beauty and spectacle. Roeg was a good filmmaker early on in his career, he captured characters and tone so vividly, 'Walkabout' is no exception. 'Walkabout' is a terrific coming of age story, Two youths being forced to adapt to the unforgiving wilderness after almost being murdered by their father for no given reason. The first 25 minutes are very disturbing and confronting, and its ambiguity makes it even more so. Throughout the duration of the film, we see these children grow before our very eyes, with the help of a young Aboriginal, who you would except to play a bigger on screen role than he actually does, but the simplistic use of the character is fantastic, he is essentially a vehicle to show the children the beauty of the earth and to guide them, they are all essentially on their on personal Walkabouts. I really cant speak highly enough of the films beauty, not only its glorious locations but its fantastic score by Composer John Barry, who's score compliments the incredible locations. Be warned, There is some graphic animal violence in the film, keep in mind this was filmed before Animal Rights act went into effect. The film features some fine performances, Jenny Agutter is fantastic here, giving a incredibly strong lead performance. The Director's son, Luc Roeg is fine as the young boy, and David Gulpilil is mysterious and enigmatic as the young Aboriginal participating in a Walkabout. 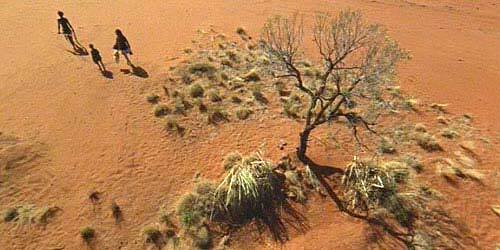 Walkabout is a beautiful and spiritualistic journey through the Australian outback, Its is impeccably filmed and brilliantly directed by Nicolas Roeg, A seminal classic in Australian film lore.